The theme for my recent visit to Grace-Marie’s Kitchen Cooking School was Italian Cucina Sunday Supper, which I was looking forward to very much, because Grace-Marie grew up in an Italian American family and has been to Italy five times eating her way through the Northern half of the country, so she knows her Italian food. The Chicken, Sausage, Asparagus and Mushroom Pasta we had was very similar to a dish she had in Italy, but instead of asparagus, the original had fresh artichoke hearts. 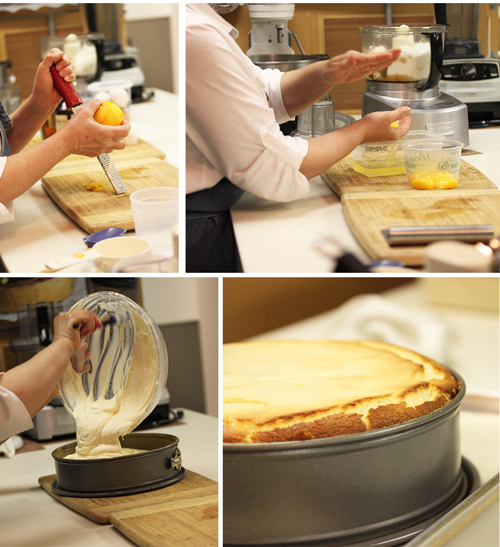 Here you can see Grace-Marie using a microplane to zest the lemon to flavor the cheesecake. She gave a demonstration on how she separates the egg yolks from the whites, before mixing the yolks with the ricotta, sugar and zest in the food processor. The heavy cream is beaten with cream cheese and sugar until thick, and a cup folded into the ricotta mixture. Then the egg whites are beaten with sugar until thick and also folded into the ricotta mixture. 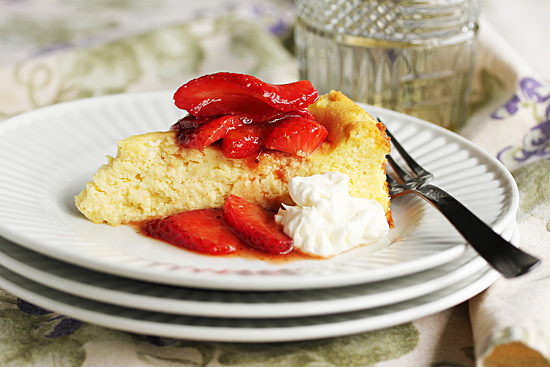 It is poured into the cookie crumb coated pan and baked until the top is barely browned and the center is a bit “jiggly.” Before serving, the sliced strawberries were mixed with fruit preserves, then spooned over the cheese cake with a dollop of whipped cream. It was divine! 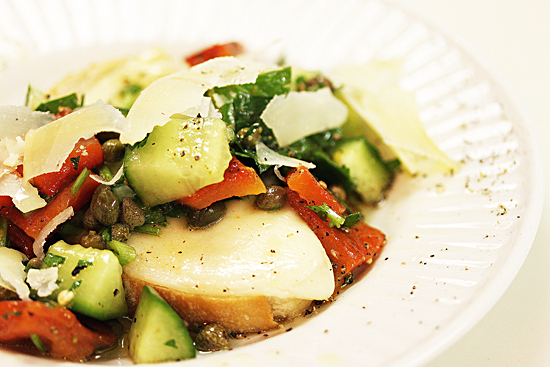 Our starter salad for the luncheon was a Provolone Bruschetta topped with Spring Cucumber & Roasted Red Pepper Salad. The crusty Italian bread was first spread with garlic that had been simmered in olive oil and then mashed into the oil. This was topped with slices of Provolone cheese and baked until melted. Over this bruschetta went the roasted red pepper, cucumber, parsley and caper salad which was dressed with an olive oil and lemon juice vinaigrette. This salad was so beautiful with shards of Parmesan cheese on top for garnish. An exciting thing that happened in January was that I had one of my photos on the cover of a magazine! You can see that the photo is of Grace-Marie’s Fiesta Papaya, Pineapple and Avocado Salad which I posted about in May 2010 and had also been in the Beach Magazine. 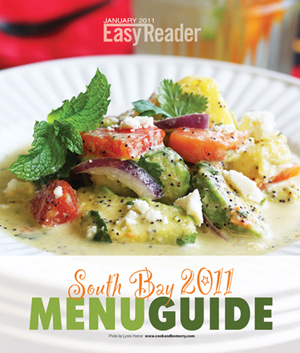 The editor liked the photo so much he decided to use it for the South Bay 2011 Menu Guide cover. Grace-Marie and I were very proud of ourselves, let me tell you. 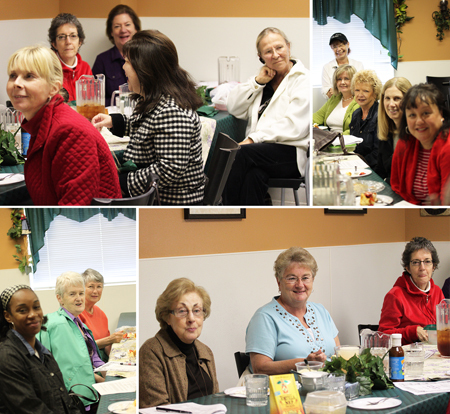 Here are the friends who came to the Italian Cucina Sunday Supper cooking class. Thank you for coming and sharing this wonderful food from Grace-Marie’s Kitchen at Bristol Farms. 2. Coat bottom and sides of a 10”-12” spring form baking pan with the butter. Sprinkle the ground cookies over the bottom, then tilt the pan to coat all sides with the crumbs. Place onto the baking sheet. 1. Combine the ricotta, sugar, egg yolks, flour, zest, Amaretto, vanilla and salt in a food processor. Process until blended well. Transfer to a large mixing bowl. 2. In a stand mixer, beat the heavy cream, cream cheese and sugar until thick. Fold 1 cup of cream mixture into ricotta mixture. Reserve the remaining cream for the garnish. 3. In a stand mixer, in a clean bowl, beat the egg whites until frothy. Increase the speed and slowly add the sugar until thick and creamy. Fold into the ricotta mixture. Transfer to the prepared spring form pan. 4. Bake 60 minutes until risen, the sides begin to pull away from the edge of the pan, the top is barely browned and the center is a bit “jiggly”. Run a knife inside the outer ring of the spring form pan, then cool to room temperature. Cover and refrigerate for several hours before serving. 1. Combine strawberries and preserves. 2. Remove outer ring on the spring form pan. Sift the powdered sugar over the top of the cheesecake. Slice into portions, plate and garnish with a spoonful of strawberries and a dollop of cream. Congrats on your beautiful photo! But then, couldn’t all of your photos be on a magazine cover? You have no idea how many times I wanted to make ricotta cheesecake:) And I make my own ricotta! I second that all your photos are potential magazine covers. Congrats! That said, the cheesecake does look divine. Save me a slice, would you? This provolone bruschetta salad looks so wonderful, and the cheese cake…Oh Wow! Gorgeous! Your photos are fantastic. This sounds like a wonderful experience. Woo Hoo!! Congratulations on the cover – a truly beautiful shot!!! 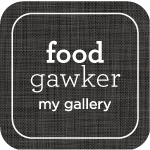 The cheese cake sounds and looks so decadent – I bet it would be divine with homemade ricotta!!! This sounds like so much fun, and your photos are amazing! 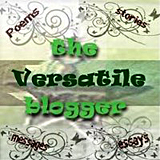 I also gave your blog an award, please do stop by my blog to accept it! That is a stunning cheesecake and your photos highlight it so well. 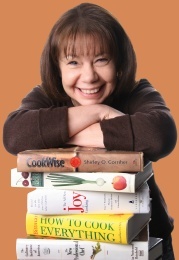 I’m looking forward to meeting you at Camp Blogaway. Next post: Hello Camp Blogaway!